Of course I had great plans for getting out of the house early, going for a bike ride, cleaning, shopping, reading, doing some school assignments (I'm in a distance learning public health program). Stayed up too late last night, woke up at 9:30 am and dawdled. Read some more of Mortals but haven't gotten out of the house yet. Though I did get grossed out by the carelessness of kittens so spent a few hours cleaning. My landlady's daughter in law came over. I don't know her real name but everyone knows her as Mae Waew or "Waew's Mother." My landlady's other daughter, Keo, who went to the US as a refugee now works in a casino in Atlanta City (I don't know her job position and have never asked) either comes over here or sends money with other relatives every year. Mae Waew just told me that she had come in person during the time that I was in Xieng Khouang. 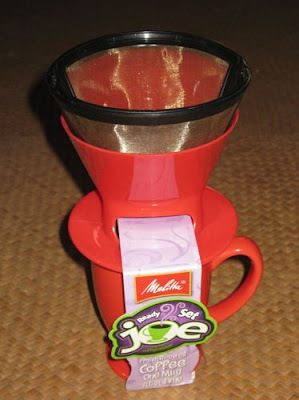 But she thought of me and had brought a Christmas gift - a one cup coffee maker in a bright red. That is so sweet of her!